1909 Nov 17. 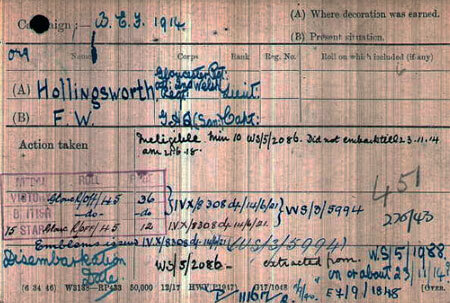 Supplementary List, Royal Field Artillery, Frank William Hollingsworth to be Second Lieutenant (on probation). 1910 Jan 7. 3rd Gloucs Reg. Special Reserve. 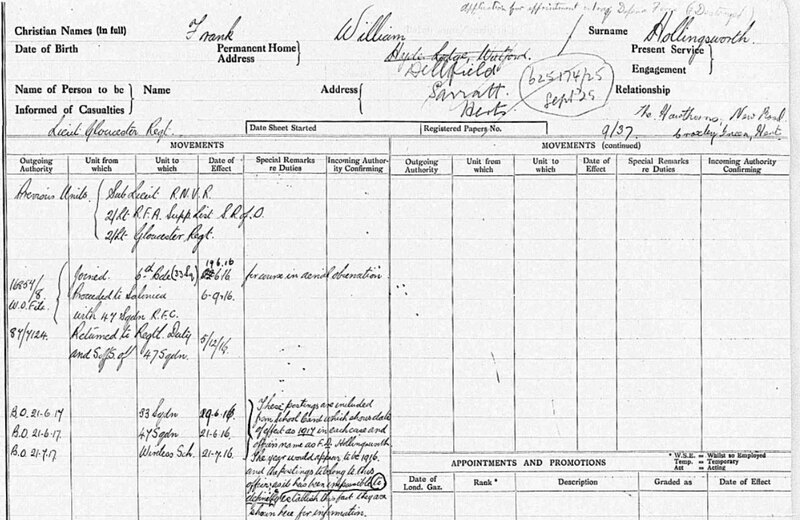 Second Lieutenant (on probation) Frank W. Hollingsworth, from the Royal Field Artillery (Special Reserve), to be Second Lieutenant (on probation). Dated 7th January, 1910. 1911 Mar 24. Special Reserve. 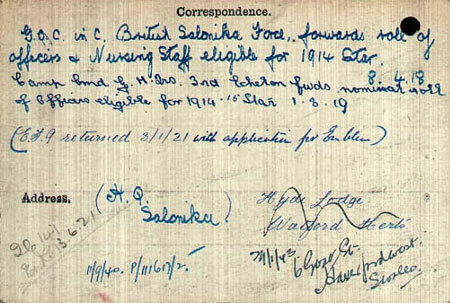 3rd Battalion, The Gloucestershire Regiim.ent, Second Lieutenant (on probation) Frank W. Hollingsworth is confirmed in his rank. 1914 Mar 11. The Gloucestershire Regiment, Lieutenant Frank W. Hollingsworth resigns his commission. 1916 Feb 2. Glouc. R.—Lt. F. W. Hollingsworth to be Capt. 1920 Jan 19. Serbian White Eagle gazetted, 5th class with swords. 1920 Apr 1. Glouc. R.—Capt. F. W. Hollingsworth relinquishes his commn., and retains the rank of Capt.